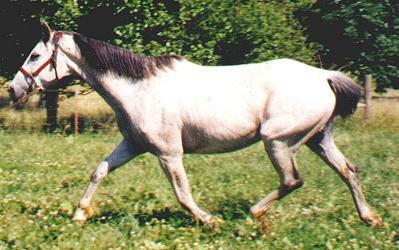 Cue is a young warblood mare that coliced for the first time two weeks post foaling. She was sent to the University as a surgical candidate, but was fortunate enough not to need surgery. She coliced again a few weeks later. It was caught in the inital stages but in the time it took for the vet to arrive, aprox. an hour, she was down and dying. A needle was put into her side to release the gas. 15 minutes later she was standing as if nothing had happened. She went to the University for another possible surgery, but none was necessary. Several months later she again coliced. Banamine was given and she was fine shortly there after. 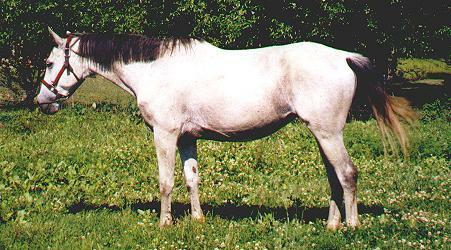 She continued to colic once or twice a year. Banimine was given IV at each insident and she was fine. Two years ago she was given an acupressure treatment for abdominal pain, stress and shock, and calming along with T-Touch ear work and banimine. She was given two other acupressure treatments with T-Touch as a preventative measure and up to this time has not had another colic episode. Acupressure and T-Touch are very effective for preventing and treating colic. Is should be noted that they are not a substitue for vet care.